The calendar might not yet say summer but as far as I am concerned summer starts with Memorial Day Weekend and ends with Labor Day. 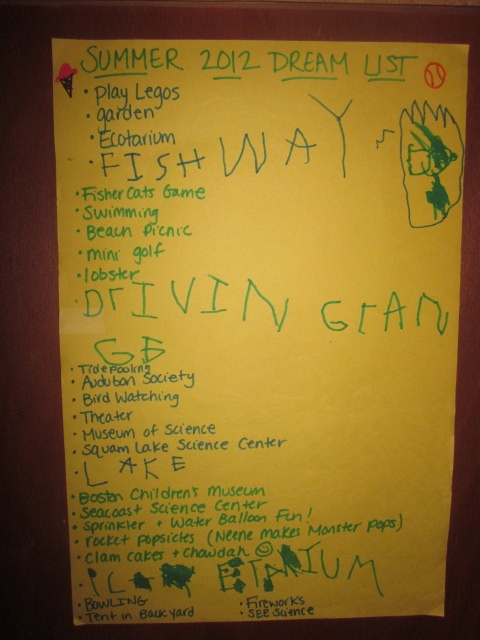 That is why Z and I spent some time last week making our Summer Dream List. This has become a family tradition and this year Z helped with some of the writing! The list is very similar to last years with a few new things added in. We hope to spend a lot of time visiting Daddy in Boston for lunch or dinner, have our weekly adventures, we will have our Mothers Helper back again this year one day a week and Lil'C has a music class once a week (a class that Z and I get to participate in as well). When I asked Z if he wanted to do any camps this summer he said, "Mommy...Summer is for Relaxing!!" I am with him on that and so we will also plan for a lot of home days where we can garden, play with water, ride our bikes, read and eat Popsicles on the deck :) School ends on the 5th and I can't wait!! I want to go to Boston for lunch! Gp Jeff & I want to try to sample every lobster roll in RI this summer. The Great RI Lobster Roll Challenge! Hope you can join in sometime. BTW... we can now take the commuter train to Boston from just down the street at Wickford Junction so maybe we can meet you in Boston when you go in to the museum or to meet with daddy? I agree, summer's are for fun and adventures with family. I like your child's comment that "summer is for relaxing", when asked about camps. Some kids are so "scheduled" there is no time for real play, it's all organized activities. Among my favorite childhood summer memories are reading books, climbing trees and going to the beach. With my own kids I tried to allow plenty of time for those sort of things. A Great Weekend of Volunteering!